Michael Groom grew up in the wild Australian mountains, in a family of mountain climbers. During his very first abseil, at the tender age of 10, his dad talked him over the edge of a 100 metre cliff. Somehow, he got to the bottom, but had experienced a life threatening fear that he would carry with him for the rest of his life. The fear that Michael will tell you has saved him many times, when others have died. In the Himalayas, fear and respect are comfortable bedfellows. The big mountains demand your respect, and respect your fear. In 1987, descending from the summit of Kangchenjunga, his first big five mountain, he suffered crippling frostbite and later had the front of both feet amputated. He was advised to get a desk job, and that his climbing days were definitely over. He succumbed to the incessant pain and sought refuge in painkillers. He became addicted. For two years Michael withdrew from the world and became yet another 'victim' of the wrath of the big mountains. Sitting alone in his little workers cottage, completely lost and numbed by pain killers and daytime TV, he never felt further from his dream - to climb Mt Everest. But Michael is not a quitter, and after enough time feeling sorry for himself and believing others about his condition, he decided that he would fulfil that dream. Slowly, ever so slowly, he trained himself to walk again. Then to run. A year later he was cycling and ready to start climbing again. First, small rock cliffs in his hometown of Brisbane, Australia, then back to where he belonged, in the big Himalayan mountains. 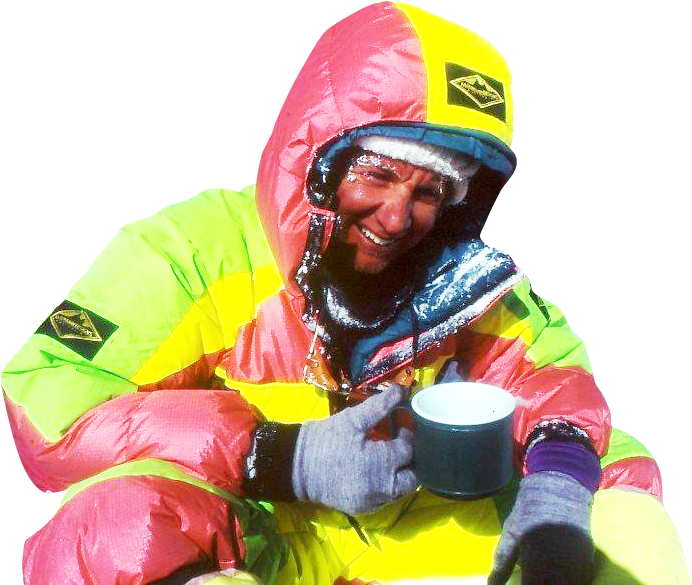 He climbed Cho Oyu in 1990. In autumn 1991, an avalanche swept him 900 metres down the Lhotse face of Everest and once again, miraculously, he survived. In 1993, Michael returned to the Himalayas in peak fitness and climbed Everest, then in 1994, K2. In 1995, the unknown Brisbane plumber climbed Lhotse, becoming the fourth person in the world to climb the world's four highest mountains. More men had walked on the moon! In 1996 Michael was one of the few famous big mountain climbers to survive yet another Mt Everest 'disaster'. Of the six climbers from his team who reached the summit, only he and American Jon Krakauer, author of 'Into Thin Air', survived. On the descent, in cruel and violent conditions, he stumbled across another American, Beck Weathers, who was now totally blind. Placing his own life in extreme danger, Michael tethered Beck to his harness and guided and lowered him down some of the most dangerous sections of the mountain. The storm killed half the team. Beck survived, but with crippling injuries to his hands and face. Michael returned home, shattered and disillusioned. It would be three years before the big mountains lured him back, and he at last summited the last of the big five, Makalu, in 1999. He was 40 years old. Michael still lives in Brisbane, with his wife Judi and son Harry. He is one of Australia’s most sought after keynote speakers. He has spoken to soldiers going off to war, athletes struggling to come back from serious injury, professional people keen to get a little closer to the truth of 'no pain, no gain', and ordinary folk who just love to sit and listen to one of Australia’s most amazing human endeavour stories. Michael Groom’s autobiography 'Sheer Will' is a can't-put-down read, his personal presentation, accompanied with impossibly beautiful visuals, is to see the earth in its purest and rawest form - the way the earth was meant to be. Michael Groom is an uncommonly determined man. He has climbed the six tallest mountains in the world, and before 1996 he climbed without supplementary oxygen. In 1987 he lost a third of his feet to frostbite and was told an active outdoor life was no longer possible for him. Just three years later he was not only walking again, he was back climbing in the Himalayas. Michael's autobiography Sheer Will was published in 1999 by Random House.